Under the leadership of the town-appointed Hartford Energy Commission, committed volunteers had worked for over a decade to promote energy efficiency, conservation and local renewable energy development, aiming to ensure that Hartford’s energy supplies will be reliable, affordable and environmentally sound. According to Martha McDaniel, current chair of the Hartford Energy Commission, the Commission had made great strides toward meeting these goals. “We started in 2007, and we were pretty proud of what we did. We swapped out streetlights to LEDs, we did municipal building audits, we did walkthroughs, changed out some lighting and participated in Weatherize campaigns.” And those were just a few of the efforts undertaken through the leadership of the Commission. But Martha and others also knew that there were limits to what volunteers and existing town staff could achieve on their own – and that there was more money-saving to be had with a deeper focus and more capacity. For years, members of the Commission discussed hiring a part time dedicated energy professional who could help Hartford take its energy efforts to the next level. In 2016 the Selectboard provided funds to hire the Vermont Energy Investment Corporation (VEIC) to conduct an analysis of opportunities and challenges inherent in the town’s use of energy, and develop a five-year energy action plan for Hartford. One of VEIC’s recommendations was to hire staff to implement Hartford’s five-year Energy Action Plan. VEIC made its presentation to the Selectboard in the fall of 2016, shortly after the arrival of a new town manager with experience in energy planning. When Leo Pullar began serving in Hartford as the new Town Manager in 2016, he was impressed with the work that the town and its residents had done to use energy in a smarter way. In many ways, Leo was the perfect person to convince the Hartford Selectboard of the opportunities and savings that hiring a municipal energy coordinator could create. Leo served in the army for 33 years, retiring from his position as Deputy Director of the Installation Services Directorate at the Army’s Pentagon Headquarters before coming to Vermont. Over his career, he commanded two military installations. While in charge of a New Mexico base, he had energy coordinators on his staff, and saw firsthand how they looked for opportunities to use energy in a smarter way, from examining building envelopes to creating secure energy networks. “I began as a skeptic, but I came to see the value of their work,” Leo said. Under Leo’s leadership, the base installed the largest solar photovoltaic array ever sited at any army base/facility. Lori Hirshfield, Director of the Hartford Department of Planning and Development, said that having Leo as the Town manager was key to getting the energy coordinator position off the ground. Having served as the primary town staff support to the Energy Commission since its inception, Lori knew there would be real limitations in relying on volunteers alone to effectively implement the recommendations of the five-year plan. And she credited Leo with acknowledging those limitations and his leadership in charting a different course for the town. In making his case to the Selectboard, Leo argued that the energy coordinator could be funded with money from five different funds and didn’t have to come from the general fund alone. “The biggest thing was that this wasn’t all going to come from billing the taxpayers,” Leo said. “We were able to share the cost among various town budgets. When you’re in a budget cycle, people focus on money. I talked about how this position was an investment in the future of the town, and was one that could help all of our residents, regardless of income or need.” Leo helped his case by spreading the cost of the position out across the budgets of departments who would benefit the most from the energy savings a coordinator could make happen, such as the water, solid waste, and wastewater funds. Leo, Lori, and the Energy Commission found a receptive audience when they recommended getting the energy coordinator position funded in the Hartford town budget, particularly with former Energy Commission leader Alan Johnson serving on the Selectboard. “The makeup of your municipal government makes a difference in what gets approved,” noted Lori. Ultimately, the Selectboard funded a full-time position, and after a national search, Geoff Martin was hired as the town’s energy coordinator. 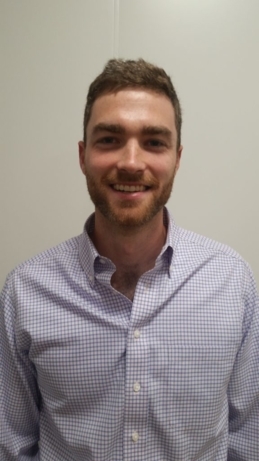 As the energy coordinator, Geoff’s responsibilities include reducing the town’s energy consumption and overall costs, strengthening the resilience and sustainability of energy infrastructure and contributing to a cleaner environment and better quality of life for Hartford residents. This year, there have been two solar projects completed on municipal buildings. There is a 98 kW system on the roof of the town’s Wastewater Treatment Plant, and a 37 kW system on the roof of the Public Works Building. At no cost to the town, Norwich Technologies installed the solar panels on the town sites. Geoff estimates that the Public Works Building will see a $3,000 annual reduction on its energy bill over the 25-year lifespan of the panels, while the wastewater treatment plant will see nearly $7,000 in annual savings. Collectively, the two projects will result in Hartford’s energy bill being lowered by $10,000 annually. Both Geoff and Hartford show no sign of slowing down. Leo describes Geoff as “working magic” when it comes to finding grants for municipal projects. He has applied for a grant for an Electric Vehicle (EV) charging station, which will be in a downtown municipal parking lot. He is also working on implementing a 120 kW solar power system at one of the town’s water pump stations as well as working to improve lighting at the Public Works Garage and the town’s Fire Station. Geoff estimates that a previous lighting upgrade and retrofit at Hartford’s Solid Waste Transfer and Recycling Center cut down on the electricity costs by 75 percent. Everyone involved with the energy coordinator position in Hartford hopes that it can be a model for other communities to follow. Lori said that communities have to understand the broader reasons why an energy coordinator can benefit a community. Read the Hartford Energy Commission’s Five-Year Plan here. Check out Hartford’s success – and track progress in your own community – on the Community Energy Dashboard here. For help in starting an energy committee – or advancing energy project’s and priorities in your town – contact the Vermont Energy & Climate Action Network. VECAN is the network of over 100 town energy committees and the organizations who support them. Learn more about how VECAN can help you by visiting www.vecan.net or calling 802-223-2328 ext. 118. Ian Hitchcock is an AmeriCorps Member and the Energy & Climate Action Coordinator serving with the Vermont Natural Resources Council and VECAN. Reach out directly to Ian to learn more about this story – or to get help in your energy pursuits – by emailing ihitchcock@vnrc.org or calling 802-223-2328 ext. 118.